The Surfrider Foundation is opposed to permanent or long-term storage of radioactive waste at the recently deactivated San Onofre Nuclear Generating Station (SONGS) due to its proximity to the coastline, susceptibility to geological instability and location within a densely populated area. Surfrider is advocating to remove the waste as quickly as possible. What is Surfrider doing to move nuclear waste off the beach? Surfrider has been actively engaged in advocating removal of nuclear waste from the current location at San Onofre. We are opposed to permanent or long-term storage of radioactive waste at the deactivated San Onofre Nuclear Generating Station (SONGS). We are also mindful of where the waste will get transferred and seek to support a consent-based location away from the risks of earthquakes, bluff erosion, wildfires, storm surge and wave events. Since the federal government is the only entity that can truly supply a long-term solution for storage of nuclear waste offsite, Surfrider has focused on advocacy to federal officials to get the waste removed from the dynamic shoreline. Surfrider has commented on federal legislation addressing the issue and has met directly with federal electeds and their staff including Senators Kamala Harris and Dianne Feinstein, and Congressman Darrell Issa. We encourage community members to use our national action alert to contact their federal representatives and urge them to help get nuclear waste off our coasts! While the waste remains on the coast, Surfrider follows developments closely, attending Community Engagement Panels (CEP), making public comments, and frequently submitting inquiries and requests to the CEP, engineering staff at SONGS, and the plant’s majority operator Southern California Edison, to enact stronger safetey protocols. Surfrider also works with local organizations and municipalities to keep the public updated, while encouraging cities to pass resolutions and advocate for movement at the federal level. Where is the waste now and why does it have to be moved? Right now there are 3.6 million pounds of nuclear waste (‘spent nuclear fuel’ or 'high level radioactive waste') onsite at SONGS. One third of that waste was transferred to an onsite horizontal dry storage system back in 2003. The other two-thirds – 2,668 spent fuel assemblies – have been stranded in onsite cooling pools designed to cool nuclear fuel immediately after being taken out of the nuclear reactor, a process which takes about 5 to 7 years. Unfortunately, because federal legislation has continually failed to provide a geologically stable and approved permanent storage site for nuclear waste, nuclear power plants across the US have been keeping their spent fuel onsite, mainly in these spent fuel pools. The issue - these cooling pools were never designed to act as storage! To prevent the risk of over-heating and explosion during pool storage, the industry standard is to transfer waste from cooling pools to onsite dry storage, as this allows the waste to cool passively, no longer relying on active 24/7 management of adding water and coolant. The transfer also prevents the need to continually release spent fuel pool water into the marine environment, which contains trace amounts of radioactive materials and toxic chemicals. Southern California Edison started this transfer in January 2018, and as of August 1, 2018, 25 canisters have been loaded, sealed and placed into a partially buried, outdoor concrete dry storage "ISFSI" (independent spent fuel storage installation) on the coastal property. It takes seven to ten days to load, seal, and transfer each canister. The entire process will take about 1.5 years for all fuel to be transferred from the cooling pools, filling 73 canisters. Although the move to dry storage canisters reduces some risk, the canisters themselves are metal and can be prone to corrosion in this salty environment, increasing the necessity that these canisters get moved offsite and away from the coastline as soon as possible. How is Surfrider taking legal action to prevent waste from being stored on the beach? Surfrider is taking action to advocate for long-term, consent-based siting within a reasonable timeframe. Since long-term storage of the fuel must be controlled by the federal government, our campaign is focused on emphasizing the need for moving waste away from the dynamic shoreline to federal officials. By working on needed legislative solutions, Surfrider is taking a proactive and expedient approach to accomplish our campaign goal of spent nuclear fuel being safely removed from the beach. Ultimately, ensuring that the 3.6 million pounds of spent nuclear waste fuel rods at SONGS are safely relocated continues to be a top priority for Surfrider in Southern California. How does Surfrider regard Edison’s choice of thin-walled casks instead of thick casks? 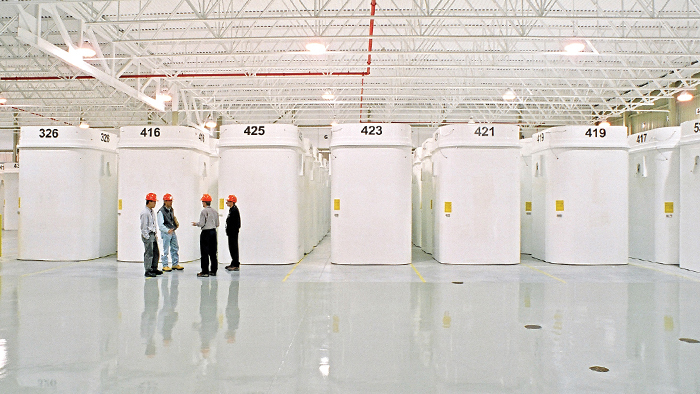 There are two types of dry storage for nuclear waste, thin-walled casks (currently being used at SONGS and most other US nuclear plants) and thick-walled casks (frequently used internationally). Thick-walled casks have better early warning systems, including pressure sensors, and also hold spent nuclear fuel assemblies in steel casks that are up to 2 feet thick. Alternatively, thin-walled casks use a sealed steel canister to hold spent nuclear fuel assemblies. The canister’s steel is less than 1 inch thick but is placed in another (though not sealed) steel “cavity enclosure canister” and surrounded by 1-2 feet of concrete. The temperature (or “burn-up level”) of spent fuel, cost and federal approval are what dictate the type of dry storage used. To date, there is no thick-cask federally approved to hold high burn-up fuel (>45 GWd/MTU) in the United States. 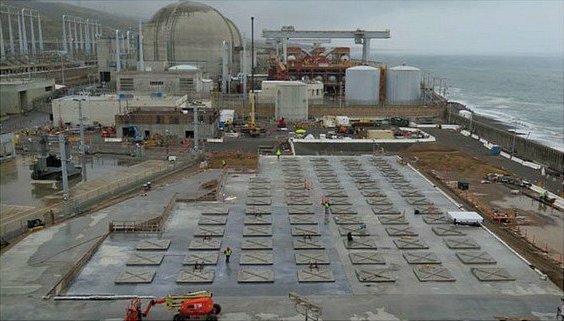 Edison claims one-third of spent nuclear fuel at San Onofre is considered high burn-up. Without a manufacturer developing, and the federal Nuclear Regulatory Commission approving, a thick cask that can hold this type of waste, the only option is the approved thin-walled canisters or the cooling pools. Since cooling pools were not designed to store waste and are considered less safe than dry storage, the safest option under current circumstances is transferring the waste to approved and available dry storage canisters. However, leaving the dry canisters exposed to the elements, and in such close proximity to the coastline is extremely concerning. Surfrider is adamant that Southern California Edison and site operators enact extensive safety precautions beyond what has been proposed. Advocated safety precautions will include keeping one cooling pool available in the event of an accident or canister cracking, a mechanism or structure that prevents direct salt or salt water exposure to steel canisters, more thorough efforts to prevent water from entering the cavity enclosure, a response plan to ensure immediate removal of freshwater, saltwater, and/or sand from the dry storage unit should it become inundated, a safety and evacuation plan at the current radii required for operating nuclear power plants, and more. What are the current options for moving waste? (1) Directly to Permanent Storage - One option is to leave waste onsite until a permanent federal nuclear waste repository is developed and approved. The federal government is required to find and approve a permanent, geologically stable repository for nuclear waste. Unfortunately, they are already 20 years behind schedule and have a long list of facilities with nuclear waste currently waiting for a “final” resting place. The most recent attempt at a final repository, Yucca Mountain, failed due to the site not meeting required geological and hydrological safety conditions. Other efforts have failed due to political reasons, with no state wanting to store the nation’s dangerous nuclear waste. The federal government needs to find a location based on the most geologically stable and safe location for an underground nuclear storage site. We ask that the federal government also implement procedures for obtaining local and state consent for such a location. (2) Offsite Interim Storage - A solution proposed in current legislation focuses on moving the waste to a Consolidated Interim Storage (CIS) facility in New Mexico or Texas as soon as possible, acting as an interim storage while a federal permanent repository gets established. 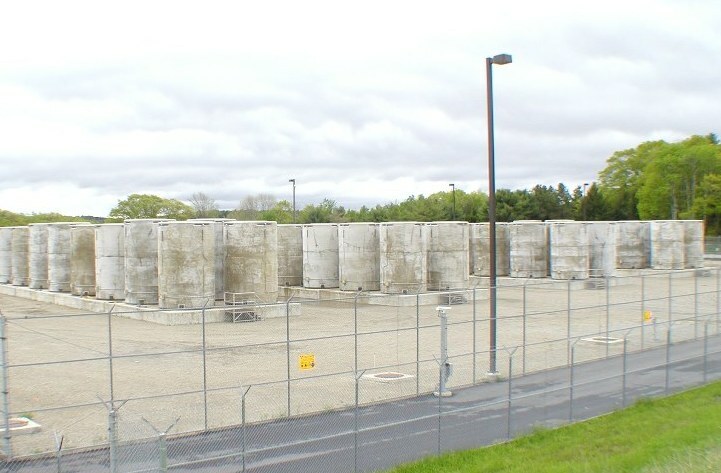 Two CIS facilities are currently under review by the Nuclear Regulatory Commission, and if approved, nuclear power plants could transport their fuel from high risk areas (like receding shorelines, earthquake faults, and densely populated areas - for example) to one of these temporary storage sites. CIS sites are expected to be designed and approved for 40 to 100 years of waste storage, and would therefore be superior to onsite storage in that regard. For this to happen, a transportation plan will need to be made and approved for safe shipment. The act of transporting waste could increase risks, with experts warning against moving waste more than necessary. Finally, CIS siting must be mindful of local residents, and ensure that communities surrounding the facility give consent. (3) Storage on the Mesa - Another option is to move the waste across the highway from the nuclear power plant, on the inland side of Interstate 5 and the railroad. This property is also owned by the Navy, and such a move would help protect against the threats of sea level rise and storm surge. Unfortunately, this move does not solve the threat of earthquakes and the close proximity to the popular I-5 thoroughfare and densely populated urban areas. This move could also put the waste closer to residential communities and wildfire risk areas. As of now, the Navy has been explicit about not allowing such a move to occur as it would put the waste closer to active military training operations. In short - this issue is complex and there is no perfect answer. Nuclear power plants were established before a plan was developed to deal with the waste they knowingly would generate. This failure of previous elected officials to come up with a storage solution is now a major problem facing us today. This issue not only affects San Onofre beach, but is a national problem. There are 31 nuclear power plants storing waste on the coast in high risk areas, and almost 100 nuclear power plants licensed across the country. The last review of US nuclear policy, including recommendations for next steps, was completed in 2012. See the Blue Ribbon Commission on America’s Nuclear Future Issues and Beachapedia’s Coastal Nuclear Waste article for more information on this national issue.